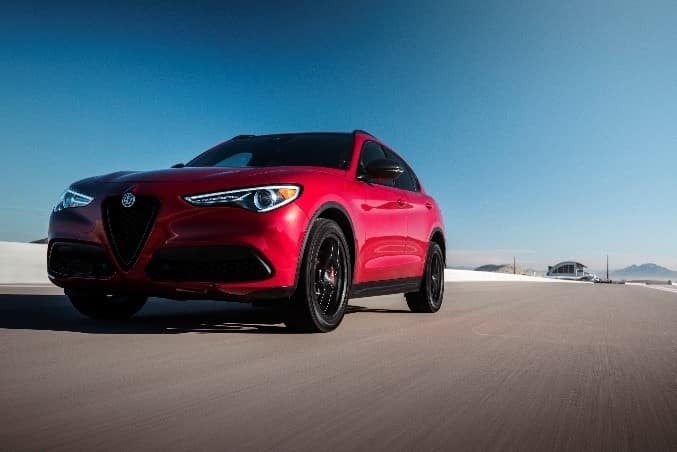 In a class of its own, the Alfa Romeo Stelvio is a new breed of high-performance SUV designed to reinvent a connection with the road. A perfect balance of seductive Italian-style and performance sets the Stelvio apart from the rest. Alfa Romeo has continued its formidable track record for class-leading innovation, most notably under the hood. Drivers seeking award-winning engine technology don’t need to look further than the 2019 Stelvio. A long-standing tradition for Alfa Romeo is manufacturing the vehicle lineup in a state-of-the-art facility in Italy, including the engines featured in the Stelvio Ti and Stelvio Quadrifoglio. The Stelvio Ti features a 2.0-liter turbocharged 4-cylinder engine that boasts 280 horsepower, 306 pounds-per-feet of torque between 2,00 and 4,800 rpm, while going from 0-60 mph in a matter of only 5.4 seconds1. Top speed for the 2019 Stelvio Ti reaches 144 mph1. The 2019 Stelvio Quadrifoglio is equipped with a 2.9-liter twin-turbocharged V6 engine that delivers 505 horsepower, 443 pounds-per-feet of torque between 2,500 and 5,500 rpm, while going from 0-60 mph in only 3.9 seconds1. Top speed for the 2019 Stelvio Quadrifoglio is an astounding 177 mph1, which is far greater than its competition. Rounding out its considerable abilities with a combination of sophistication and craftsmanship, the features and packages for the 2019 Stelvio impress drivers and passengers alike. Experience everything the iPhone has to offer through the Information and Entertainment System in the 2019 Alfa Romeo Stelvio. The Apple CarPlay® compatibility allows drivers to browse music, emails, find nearby restaurants, upcoming weather conditions and more. Drivers can stay focused and productive while on the road with voice controls that allow them to reply to emails or messages, schedule appointments, and listen to their favorite music with Google Play. The premium audio system by Harman Kardon® Designed to provide concert-like sound, the available 900-watt, 12-channel class-D amplifier and Logic 7® sound technology distribute clear sound through a system of 14 premium speakers and subwoofer. Proof that Stelvio can carry more than cargo. The system is equipped with dual-ultrawideband radar sensors that aid the driver when changing lanes and alert the driver when trailing vehicles are in their blind spot via an illuminated sideview mirror icon. 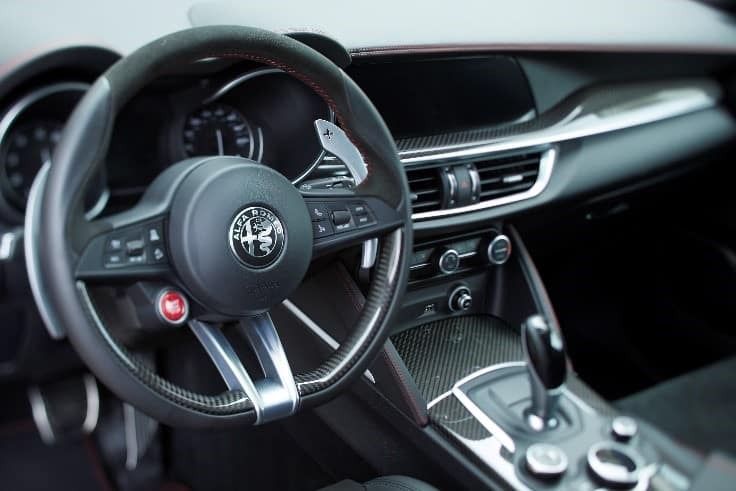 The Alfa Steering Torque (AST) functionality takes advantage of the integration between the Electronic Stability Control system and the electric steering wheel to increase the safety level of the vehicle. Thanks to the AST system in dangerous situations, like braking on an icy surface, the system activates an additional torque on the steering wheel giving the driver the best in safety and stability. Activated when the vehicle is in reverse, this system lets the driver know when vehicles are behind them via an illuminated icon on the sideview mirror, in addition to an audible chime. The electric power steering produces an optimal stopping stability while also providing greater stability in certain braking situations, like a different adherence of each wheel. The 2019 Alfa Romeo Stelvio is an SUV that has it all. Drivers who are searching for an award-winning SUV can find the Stelvio at our showroom on Central Ave in Albany, NY.